ANNISTON, Ala. – Blastcrete Equipment Company launches the Dampcon Rig pre-dampening and gunning system. 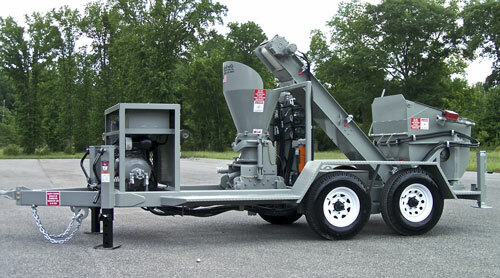 Consisting of a variable speed mixer, conveyor and gunite machine, the Dampcon Rig offers contractors a complete system to pre-dampen and install dry process shotcrete materials, and is ideal for concrete repair and precise refractory gunning installations. The Dampcon Rig features Blastcrete’s 020 “Piccola” Rotary Gunite machine to offer precise material output control and a delivery rate of up to 6-cubic yards per hour. The user-friendly machine is easy to operate and maintain, and features a simplified one-bolt clamping system. Unlike typical systems that include three to four adjustment bolts, the Blastcrete system has been designed to require just one bolt, making it easy to adjust and ensuring an excellent seal every time. A 9-cubic foot capacity paddle-style mixer is designed to pre-dampen the gunning materials, and minimize dust and wasteful rebound material. Furthermore, the unit includes rubber wipers that clean out and reduce material build-up in the mixer. A material elevator with cleated-belt conveyor transfers material to the gunite machine’s receiving hopper. The mixer is also equipped with a water meter and bar to ensure the proper amount of water is added to each batch. The entire unit is designed to be extremely easy to clean and maintain. By mounting the gun on casters, it can be easily pushed to the front of the frame so the belt can be cleaned. In response to customer requests, the mixer features swing-out capabilities for further simplified maintenance and cleaning. Simply unclamp, swing out the mixer and open the door for access. The entire unit can be cleaned quickly using just compressed air. Air requirements for the Dampcon Rig are 250 CFM at 90 PSI. Power options are either a Kubota V1505 29-horsepower water-cooled diesel engine or 20-horsepower electric motor with starter and disconnect. The unit is available as a tandem axle trailer or skid mount with forklift pockets. The trailer-mounted model can be towed with a 3/4 ton pickup and the axles are equipped with electric braking capabilities. A hydraulic water booster pump is also optional and ideal for jobsites with no pressurized water. For 60 years, Blastcrete Equipment Company has been manufacturing safe, reliable and user-friendly solutions for the shotcrete industry. With a complete product line consisting of concrete mixers, pumps and related products, Blastcrete Equipment Company is poised to meet the needs of the commercial and residential construction, ICF and SCIP building systems, refractory and underground markets. For more information, contact Blastcrete Equipment Company or call 800-235-4867.